This wonderful recipe came from Bakerella. I've made it several times and it's always a hit. I had my husband take the rest of the cookies to work this morning so they wouldn't end up on my hips. Too late!! The little red and white polka dot plates are a recent Target purchase and the yellow bowl came in a set of three from T.J.Max. 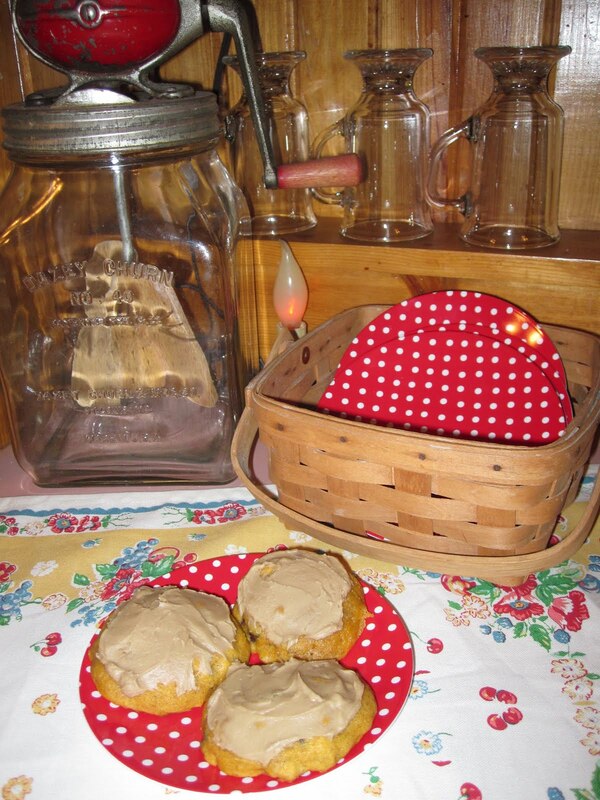 "Pumpkin Pecan Chocolate Chunk Cookies"
Whisk together flour and pumpkin pie spice. Set aside. In a large mixing bowl, cream butter. Add both sugars and beat until light and fluffy. Add eggs one at a time and beat until combined. Add flour/spice mixture to sugar mixture in three additions. 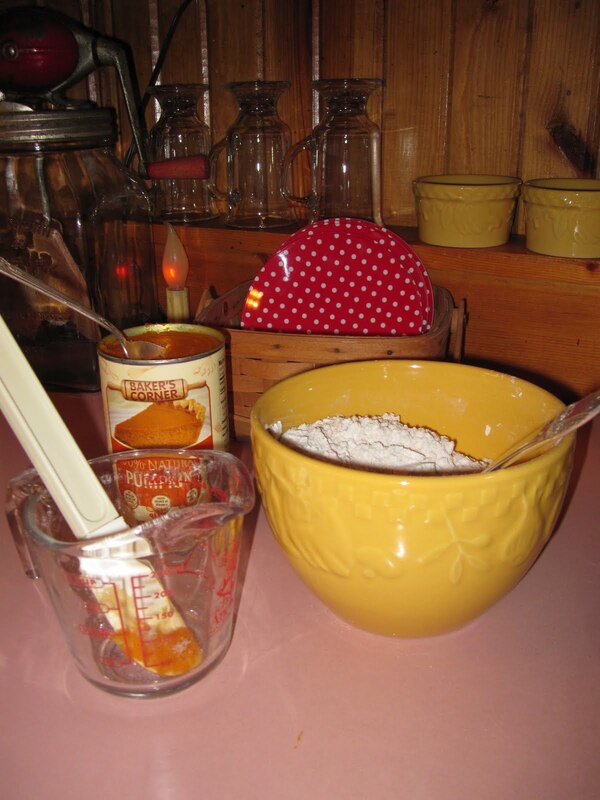 Alternate with pumpkin in two additions, ending with flour mixture. Stir in chopped pecans and chocolate chunks/chips. 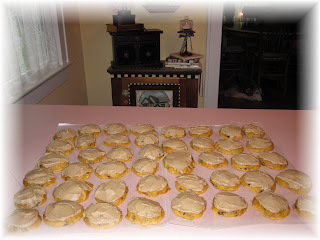 Drop on cookie tray lined with parchment paper. Bake at 350 degrees for 10-12 minutes. Makes about 4 doz. In the above photo with all the cookies on the counter, if you look carefully, you can see this cute little cupcake stand that my sister gave me as a birthday gift a few months back. 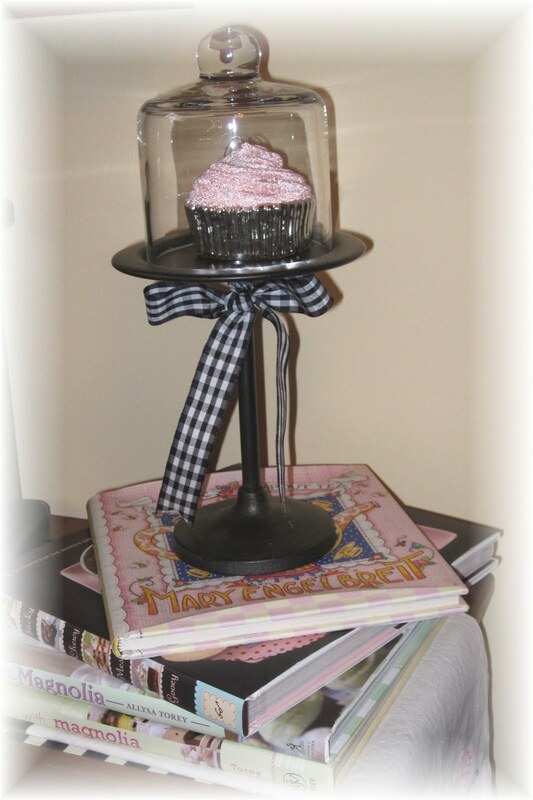 Click to enlarge the photo below so you can see all the cute cookbooks that it's standing on. I purchased the bottom three from Amazon and will bake something from them soon and give them a review in a future post. 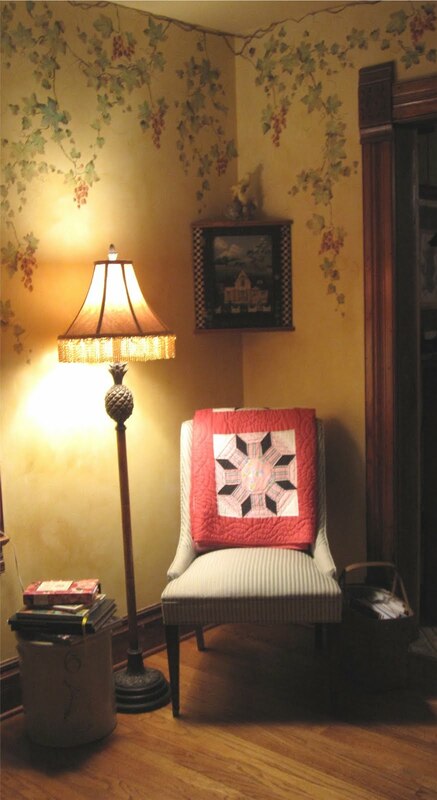 Now grab a warm cookie and follow me to my little reading corner in the living room. 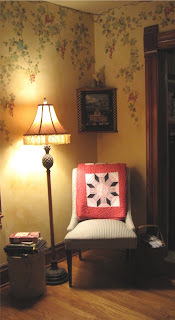 Grandma made the quilt that hangs on the back of the chair. This is my view directly across from my reading chair. I know most decorators don't like family photos, but I love mine and proudly display them. 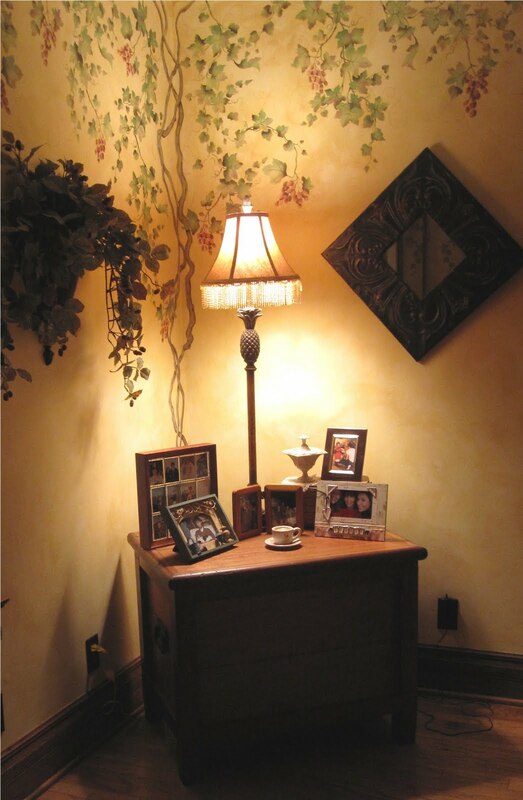 This table lamp matches the floor lamp by my chair and sits on top of an antique ice chest. 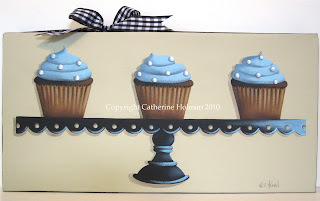 This is one of the cupcake paintings that I've repeated in order to get a better photo for larger prints. It's available in my Etsy Store. The larger prints are available on my new Fine Art America Store. We had three inches of rain last night with flash flooding in our area. So, the good Lord willing and the creek don't rise, I'm off to the post office! Those cookies sound and look delicious! What a wonderful place to read....a cozy little nook. those cookies look and sound wonderful! These sound yummy Catherine, I shall have to bake. Not that I need an excuse. They too will land on my hips. OH MY those cookies sound so darn good ,, and seem pretty easy to make,,, even me........ hehehehe I will have to write it down and make some this weekend,,, we are getting some rain so will be a great baking day....and I adore that cupcake stand,,to cute..... your reading corner is so comfy looking... have a great weekend. In the photo with all the cookies on the counter, I see Annie,the famous one eye wonder dog sleeping on the dining room floor. Catherine, the cookies look and sound delicious!! Yum. I like your little reading space. Very comfy and cozy. Great painting, cozy corner! I love my family photos also, who cares about decorators?